Click each link for Part I, III and IV. It must be emphasized that there is no definitive COL set-up, since it already exists within the imagery of standard brightfield, but its presence is nullified or flooded out. 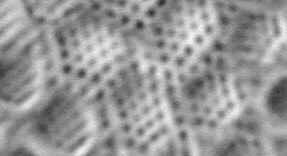 The purpose of the annulus or stop is to mask the unwanted central light component from this brightfield image, so that the COL phase contrast imagery generated by the peripheral regions of the objective can be revealed. An ANNULUS or STOP ? Strictly speaking an annulus allows a coherent ring of light to pass through the condenser to produce phase contrast or COL effects. My experiments have led me to circumvent the making of a traditional annulus, because it is highly desirable that the outer regions of the light cone should be variable. Therefore an annulus not having variable outer proportions is less versatile. An ordinary circular stop as used for darkfield, though smaller, will yield the COL phase reversal effects, and if placed near the iris diaphragm, the latter can be closed down to control the outer proportion of light input to the specimen. Thus the overall effects can be radically changed by simply altering the size of the iris diaphragm. In practice this works extremely well, providing that the iris is concentric with the stop. 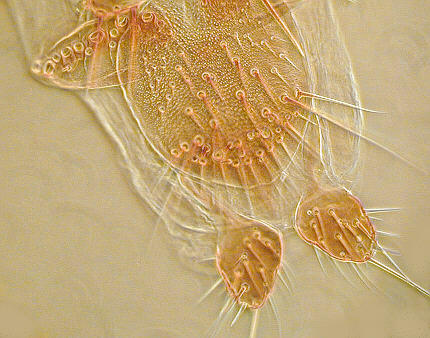 Complete concentricity in the microscope's optics makes for better COL effects. These initial trials are set out to introduce those who have no phase equipment, and have not experienced COL before, in a quick and uncomplicated manner. Then look at the diatom whilst altering the position of the condenser until you see a dark central zone, which will confirm the field stop's centrality, if you are in doubt about that. Now rack up the condenser until the dark zone just disappears. You will, if the condenser is of the simple Abbe form, see some splendid colour backgrounds as you move the condenser about its usual position. This is perfectly normal in these circumstances, and the final position can be determined which provides the most pleasing effects regarding background and contrast etc.. This initial view contains a proportion of COL and darkfield components, but the phase reversal contrast enhancing effects will still be seen. detail of phase reversals. Adjusting of condenser dictates colour backcloth. properties of COL using the humble x40 achromat ! Optimising this simple set-up can be accomplished by adjusting the position of the condenser, and/or trying smaller or slightly large stops on the field lens. 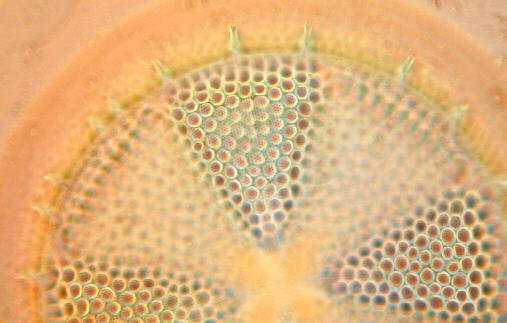 If you cannot gain success so far, try another diatom slide, as the COL phenomenon is quite sensitive to the optical properties of the diatom and its mountant medium. If still no change, then it could well be that your objective has flaws of one kind or another around the edges of the elements such as delamination, or fungal growth. NB.......The images you will have seen like those above are not purely COL, because there is the darkfield component overlaying the COL. However I have mentioned this because there can be a distinct advantage in the perceived resolution and general presentation of the diatom etc.. By using an annulus which blocks the DF component, pure COL will result, which might suit certain subjects better, and may appeal to some observers. The diagram below shows how this stop on the field lens works. Only one one side of the condenser's output is shown of course. ES represents the light from the edge of the stop, and FB represents the light at the maximum field boundary, which in most microscopes with condensers of at least 0.9 NA will project light beyond the x 40 objective's front element....This is the darkfield component mentioned above. 2) The position of the stop. 3) The suitability of the various forms of condenser. Thickish aluminium foil is the easiest material to cut into a disc for the stop, since its outer edge should be sharp and thin like the iris. For most observations the disc does not have to be perfectly circular, but this should be the case if possible because the iris can be used to greater effect when closed down to reduce the DF component. Blackening it is not essential but does reduce stray light from reflections. Its diameter should be such that your objective's back element displays a circle of peripheral light of thinnish proportions as shown above. It will probably, in most microscope's, need to be a little narrower than you have used on the field lens, because it should ideally take its position near the iris diaphragm. The ideal site for the stop is near the plane of the condenser iris, i.e.. near the anterior focal plane of the condenser. The filter tray is good enough to start with, but suffers from the disadvantage that it should really be able to be centred at times. Stops placed in the spare apertures of phase condenser Zernicke discs work very well, provided the iris diaphragm is independent of this, which is not the case with some Zeiss phase condensers. 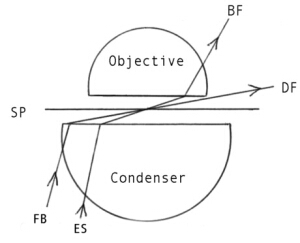 Above is shown the principal of a dedicated condenser for COL using a preferred objective, which has a stop attached to the underside of the condenser's bottom element, with the iris controlling the outer DF portion of light. What really matters is that the stop is concentric with the condenser's axis and iris. This is vital and the effort to put this into practice will pay dividends. There are many ways of mounting stops near the iris in either a temporary or permanent way. This will ultimately depend on the observer's needs regarding COL/DF and their imaginative DIY skills. Adapting an old iris/lens mounting from an obsolete camera etc. incorporating a stop, or series of removable stops to suit different objectives mounted just beneath the condenser will appeal to those requiring speedier illumination changes. A case could be made for the acquisition of a phase condenser substage unit for your 'scope, if fixed annuli will suit your needs. Those who have a second microscope may adapt it for COL? Fortunately, the Abbe or achromatic condenser are both well suited to COL up to and including x40 objectives. The achromat has the edge regarding the use of oil immersion objectives for it provides a more accurately coherent cone, as does the aplanat over the Abbe. However, the intrinsic chromatic aberrations of the Abbe can provide some advantage, in that by its careful focussing we can bathe the specimen in apple green light, the preferred colour for achromatic corrections, which I find elicits the best imagery regarding contrast enhancement and general viewing comfort. One very important issue regarding the comparison of brightfield and COL, is that the former is rarely used at full aperture, prejudicing maximum resolution from the objective because of iris closure requirements. COL can utilise the max NA of the objective every time. The variations of annulus/stops are endless, and the experimenter might consider the effects of 2 concentric annuli, one just inside the NA of the objective (COL) and one just outside (DF), thereby bypassing the peripheral edge of the objective's elements where presumably some light might go astray etc............It's a thought. For me COL, and especially when in use with the iris controlling the DF component, is the preferred illumination set-up to brightfield for a number of specimen types. More experimentation is on the way for me, and I hope some readers will have had their appetites whetted accordingly. What truly amazes me is that COL has been known in principal and practised by a few workers for over 50 years, yet the microscope manufacturers, as far as I know, have never incorporated its great advantages into the standard microscope? The cost would be trivial compared to phase contrast, but the benefits would be so appreciated by many observers. ...............Pity. All comments welcomed to Comments to the author sent via our contacts page quoting page url plus : ('pjames','')">Paul James. Read Part I and Part III of the series. Published in January 2003 Micscape Magazine.